As most driving experts will admit, the best choice in snowy and icy weather is to not drive at all. However work and other responsibilities may require you to drive on snow and ice. Or, as has happened to me, you may have started driving on a clear winter day only to get stuck in a snow storm later quite far from home. These are some winter driving tips that I have had first hand experience using on snow and ice. well before the winter weather comes. Make sure your tires are in good condition with plenty of tread. This should be done early in the fall before the weather forecast says snow and ice is on the way. If you wait until the last minute before the snow storm comes, everyone will be at the tire shop getting their snow tires on and chains for their vehicles. You may literally be left out in the cold for lack of time and equipment the shop has from the rush. Tire rack.com suggests you should have 6/32nds of tread for snow and 4/32nds for heavy rain. this is at least twice as much tread as the legal limit of 2/32nds of tread. This winter driving tip should be done in spring before the hot weather as well as in the fall before the cold weather. If the radiator overflow jug is low, fill it up and find out why it is low. Checking your antifreeze If there is a leak or a clogged radiator have it fixed. Also know when you need your antifreeze flushed out and replaced. Is it the green stuff that should be flushed every two years, or the pink stuff that can last as long as 10 years? Your mechanic can test the radiator fluid for a breakdown of properties that protect your radiator and engine. Is your car battery in good condition? Extreme heat from the summer can significantly weaken a cars battery, causing excessive discharging and corrosion. Since a battery needs more power to start in very cold weather,you want a fully charged battery with clean cables and terminals. If your battery is more than three years old it may be time to have your car battery replaced. Before the cold weather hits, use this winter driving tip and make sure the battery terminals are clean for the best connection and that your battery has a full charge. How to clean a car battery Replace your battery if necessary. If a battery is fully discharged it is likely to become frozen in freezing temperatures, causing it to be unrepairable. If you have noticed your windshield wipers streaking, becoming extra noisy or the rubber separating from the blade, you are in need of a new set of wiper blades. This can be easy to forget during dry summer months. The summer heat can crack and warp the rubber on the blade. You may not realize the damage until the fall when the rain starts. Replace your windshield wipers before the heavy rain and snow. Remember that on snow and ice stopping distance is at least twice as far as on dry pavement. It's very important to have brake pads and rotors that are not near the point of needing replacement in winter weather. If it has been over a year and a half since your brakes were inspected or if you hear squeaking when you apply your brakes, you should have them looked at and have them replaced if needed before severe winter weather comes. Also consider having your Brake fluid flushed if you haven't in two years or more. Moisture can accumulate in the brake line not only causing rust but the moisture will vaporize from the heat when you apply the brakes causing less braking pressure and more stopping distance. Something that could mean the difference between a collision and a safe stop on snow or ice. Keep your vehicle in 1st or 2nd gear on snow or ice. A lower gear not only keeps your car moving slower, it gives the tires more power and more traction which is vitally needed on slick roads. Put your vehicle in a lower gear when turning. Because of the weight shift on a turn it is much easier to lose control (even in dry weather) in the middle of a turn. It is very easy to skid even in 2nd gear on icy roads when turning, 1st gear is safest. Use the gas pedal and brake pedal as gently as possible at all times on snow and ice. Any pressure on either pedal causes the weight of the vehicle to shift. (brake pressure sends weight to the front, gas sends it to the rear). This can cause a dangerous loss of balance and control on ice. Therefore use very little pressure on either. This also means brake very early. This is contrary to the teaching of safe driving practices but icy conditions require different driving than in dry or wet but non-freezing conditions. Snow and ice are the only time I would suggest using neutral to help brake, and once you are stopped, immediately put the gear in 1st or 2nd again. Neutral disengages the engine from the wheels so the engine isn't moving the car forward. This brings a car to a stop much quicker on ice. I was on my way to a student one morning when heavy snow started falling half way to her house. Although I was driving slow and careful in 2nd gear, as I made a left turn my tires lost traction and I started skidding slowly toward a stopped car to my left headed the opposite direction. I remembered what my boss told me about using neutral to come out of a skid. As soon as I put my car in neutral my car immediately stopped just about three feet from the other vehicle. This winter driving tip saved me from a collision. This is pretty much common sense. 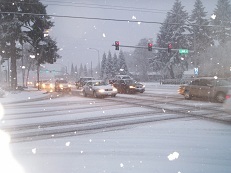 There are several reasons using busier roads in snow is a good winter driving tip. More traveled roads will be partially cleared by other traffic. There is a higher chance the city has brought snow plows and deicers on busier streets. If you do get stuck on the ice there is a better chance of finding help on a road with more traffic. In South East Portland in 2008 many drivers with Jeeps and other 4WD vehicles believed because they had chains on their tires, their vehicles could safely get down the steep hill of Johnson Creek Blvd. from Mount Scott. It was laughable to watch the clips on the news of many SUVS' with chains sliding into parked cars on the hill because there just wasn't the traction the drivers thought there would be. Even straight, flat, frozen, wet roads can be unpredictable. The drivers on them are unpredictable as well. The best of drivers can easily lose control on ice with one slight error with the steering or the pedals. Wait until the roads unthaw before driving on them if you can. It will be safer and a lot less stressful behind the wheel if you do.